Is SSA Music Camp a sleep-away camp? Yes! All campers sleep at camp for the duration of the session they are signed up for. My child has major food allergies. Will they be able to come to camp? Of course! We have a wonderful kitchen staff who will work with you and your child’s dietary needs. Where can I send mail to SSA campers/faculty/staff? We suggest that parents bring letters/packages for campers and give them to the SSA staff during check-in. Mail delivery can be slow, and Presbytery Point has been getting camper mail the week after campers leave. We can hand out letters and packages throughout the week if they are given to us at check-in time! What kind of performing opportunities are there? A lot! Each camp session opens with a faculty recital and ends with a final orchestra concert. 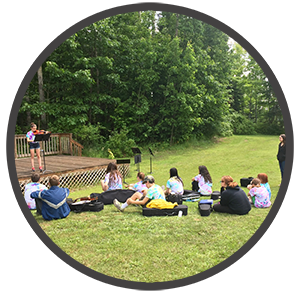 Camp Presto and Camp Vivace will each have a chamber music recital (in which every camper participates). Camp Vivace will also have a solo Honors Recital. Registered campers will be notified about how they can audition for the Honors Recital with a prepared solo.